We all want our kids to be well educated, and we have been striving to make our children’s education better for centuries, from finding the best written books to hiring the most renown teachers. But are teachers and books generally the only primary means of education? Until very recently the answer had always been yes. The innovation in computers and the internet has completely shifted how we communicate, share, and learn, and for the first time in thousands of years, we have seen a revolution on how we can teach ourselves and others. With their small form factor and good portability, tablet computers provide huge benefits for the learners by providing instant access to vast number of knowledge bases, interactive books, and accessibility for the disabled, instructional videos, and hands-on experiments. 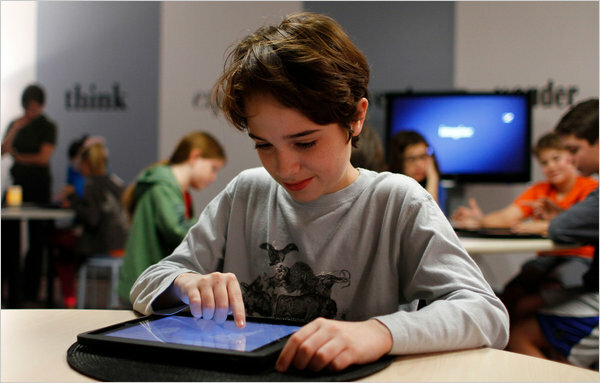 As such, it is very important that tablet computing becomes an integral part of children education. The first thing that might come to mind when thinking about using tablets in education is the skepticism that it is another attempt to try and replace textbooks from the classroom. These questions have been raised in the past: “will TVs replace books?” or “will videogames kill books?” But the answer has always been no. Books have always been the primary means to spread knowledge because once writing was invented, people gained the ability to share their wisdom with more people that ever possible with verbal communication. Therefore, the answer to the question “will tablets kill books?” is “no, it will not”. But a better question would be “will tablets make books even better?” Now, this is an interesting question, and one that is worth exploring for the sake of better education. Books can now become alive and offer a far better experience and result through the use of tablet computers. There are several ways this can happen. Firstly, tablet computers allow books to become connected with the rest of human knowledge, something seen as magical not too long ago. Readers can tap on a word and quickly look up its definition, synonyms, and translation. Readers can also instantly and conveniently research, in other sources, the subject they are reading about. These things were possible to some extent in the past. People could get up and look up a word in a physical dictionary or research the subject in an encyclopedia. However, not only do tablet computers yield a broader range of search results with less time, but it is also much more convenient. And the mere convenience of doing so using a tablet computer will likely mean that the reader will actually look up the definition or do the research. Having to get up and physically grabbing a dictionary greatly reduces the likelihood of looking up a word, for example. Secondly, books on tablets have a greater potential to effectively explain difficult material or to let readers be more immersed in the content than physical books could ever hope to do. We have imagined future cars, future robots, but rarely did we imagine “future books”. Nevertheless, the future books are almost at our fingertips with tablet computers becoming mainstream. Leo Laporte, from the podcast MacBreak Weekly, believes that books will soon no longer be composed of only texts and images. He believes that eBooks will soon contain interactive content, like videos clips and audio clips. Laporte gives an interesting example of a biography eBook that could include audio clips of famous interviews or an imbedded YouTube video about the person (Laporte). I would like to add that besides videos and audios, books have the potential to include built-in interactive applications! Continuing with the example of the biography, I think it would be very neat and informative if the eBook contained, say, a virtual home of the person. It would be quite exciting to be able to virtually walk around the home of a famous person. And it doesn’t have to stop here. Educational eBooks could use of interactive diagram to greatly increase effectiveness in explaining concepts. For example, a chemistry eBook could include 3D models of atoms that readers could pan and rotate with their fingers. Express Publishing in ELT Teacher’s Corner produces eBooks that incorporate these interactive features, and they sum up quite well how much more immersive and fun these kinds of books can be. “Express Publishing has come up with…interactive eBook in the EFL market, with animation, video, games, songs, stories, an audio visual dictionary and much more. With Spark interactive eBook…students are encouraged to become autonomous learners through research tasks and are both challenged and supported through a variety of multi-sensory tasks at different levels of complexity using different approaches. Students can get instant evaluation and personal scores” (Express Publishing). It is evident that tablet computers can make reading and learning more immersive and enjoyable, but it doesn’t stop there. Tablet computers allow books to be more accessible to the disabled than they ever have been in the past. People and organization have been working to provide equal access to learning material to disabled students like those who suffer visual or hearing impairment. Tablet computers are a major contributor to this goal. EBooks are inherently more accessible than are physical books. I have severe visual impairment, and it is very difficult for me to do certain tasks, such as reading small prints and reading/writing quickly. I am thankful for the aid offered to me from my educational institution, such as extended time on tests. However, I have found that eBooks have proved to be extremely helpful to me because of their inherent accessibility capabilities. I am able to zoom in eBooks as much as I wish to help me read more easily. Also, software like Adobe Reader has amazing read-out-loud feature that is able to transcribe text and read it out loud quite naturally. Disabled student being able to carry a small device that enlarges font and reads out loud books is an example of a major advancement in accessibility technology. So far, we have looked at how tablet computers could enrich books. We haven’t yet explored the other infinite amount of possibilities that come with using a tablet computer. Two other aspects of tablet computers beneficial to education help pose a good reason for implementing tablet computers in children’s education. Firstly, tablet computers offer many educational applications that allow children to be motivated to learn and explore knowledge. The Apple Apps Store provides a variety of educational apps for the iPad to help students learn. “apps help students master English at all levels — from learning how to read to practicing writing and grammar skills to studying classic literature [and] With interactive ways to learn numbers, master multiplication, solve algebraic equations, conquer statistics, and more, these apps for all ages make math more engaging, interactive, and fun [finally] Explore these apps and discover more about how the world works. Learn biology, physics, chemistry, anatomy, astronomy, and more. And find field guides that you can take with you on your next nature hike” (Apple Inc.). Secondly, a tablet computer gives student access to educational videos from anywhere. With the advent of the internet, every student now has access to educational videos created by instructors from all over the world. According to Google, which runs YouTube, “videos can engage students, spark a conversation, bring lessons to life, [allow students to] learn from other teachers.” Google states that YouTube has “Over 450,000 educational videos from leading educators!” (YouTube for Schools) To further benefit students, Google is launching YouTube for schools, a special version of the popular video sharing service. YouTube for schools will bring front the thousands of educational content while keeping a safe environment for the classroom. This version of YouTube, for example, won’t have any comment system or videos other than educational ones (YouTube). Salman Khan is one of the most recognized instructors on YouTube, with daily video tutorials from subjects ranging from math, science, history, geography, etc. Khan has given a speech in a TED conference. He explains that learning using videos bring lots of benefits. For example students are not shy to go and rewind and listen to something multiple times to understand a concept; this eliminates the problem in which students fear asking an instructor to repeat the same concept too many times. Khan encourages instructors to adapt lecturing in forms of videos and let students work on “homework” in the classroom where teachers are here to help (Khan). Having a tablet at hand means students can watch educational videos from their desk in class or from wherever they choose. Dedicated apps for tablet computers can help create a virtual educational environment, incorporating educational videos. With tablet computers, students will not have to worry about not having acce3ss to the video anytime they wish; these portable devices let students carry thousands of instructional videos as easily as they carrying a textbook! We are in a revolution. The internet has drastically changed how we do a lot of things, and education is not excluded. Tablet computers, combined with access to eBooks, educational apps, and thousands of instructional videos, has great potential to truly enrich education like never before. These PCs provide a more interactive learning, better accessibility for the disabled, and a far richer learning opportunity. Ultimately, these devices no longer confine students to their classroom; young students today can now access knowledge from all over the world and from people living anywhere in the world. With these amazing opportunities for a better education, there is no reason to not work to bring tablet computers in the hands of our young learners. Apple Inc. “Thousands of apps. Endless potential.” Advertisement. Apps in Education. Apple Inc., 2011. Web. 12 Dec. 2011. <http://www.apple.com/‌education/‌apps/>. Express Publishing. “Interactive eBooks.” Advertisement. ELT Teacher’s Corner. Express Publishing, 16 Sept. 2011. Web. 12 Dec. 2011. <http://www.teachers-corner.co.uk/‌interactive-ebooks/>. Khan, Salman. “Let’s use video to reinvent education.” TED Conference. YouTube. Web. 12 Dec. 2011. <http://www.youtube.com/‌watch?v=nTFEUsudhfs&feature=channel_video_title>. Laporte, Leo, Sarah Lane, and Andy Ihnatko. “MacBreak Weekly 273 – iTunes Mismatch.” TWiT. TWiT, 15 Nov. 2011. Web. 12 Dec. 2011. <http://twit.tv/‌show/‌macbreak-weekly/‌273>. YouTube. “Educate, engage, and inspire your students with video!” Advertisement. YouTube. Google, 6 Dec. 2011. Web. 12 Dec. 2011. <http://www.youtube.com/‌schools>. YouTube for Schools: Join the Global Classroom Today! YouTube. Google, 6 Dec. 2011. Web. 12 Dec. 2011. <http://www.youtube.com/‌watch?v=NegRGfGYOwQ&context=C24e0fADOEgsToPDskJGLNSDsDElJpHepZs3KlU6>.